I promised to notify you all if something inexplicable or disastrous happened on 16 DEC 08, and I need hardly tell you that nothing did. Eventually something milder did occur: I mislaid my little tin of Potion. Until yesterday, anyway, when, cleaning up, I discovered it again (it was in a box of papers, an object not in short supply in this household). I am pleased to report that it is exactly as I left it: powerfully fragrant, richly carnationy, and as unyielding in texture as a marble countertop. I don’t love solid perfumes, but they do have their upsides: they’re portable with no chance of spillage and you can apply a very tiny amount without any risk of offence. The main downside is that they are as a rule uncomplicated things: the waxy matrix that holds the scent has a way of damping a lot of the notes, so a solid version of even a complex composed scent is going to be simpler than the alcohol-based version. 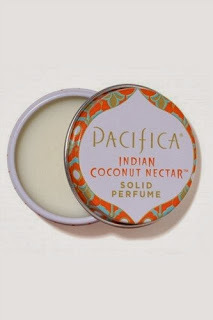 Still, maybe you want something uncomplicated, and you could do a lot worse than to check out the Pacifica line, which has at last count 23 solid fragrances. I tried out a bunch of them — maybe ten? — at Asakichi in San Francisco last month, and they were a mixed bag indeed: some of them were kind of awful (Mediterranean Fig) and some that I assumed would be naturals for me just didn’t work (Mexican Cocoa and Spanish Amber). I ended up buying four, three of which were exactly as their names imply and one of which was just a fraud, but this is what happens when you buy a perfume without putting it on your skin and letting it breathe for a while. Island Vanilla is a warm rich patisserie vanilla; that’s just about all that can be said about it, and that’s plenty. Unless you demand that your vanilla be something besides gourmand, it's an excellent all-purpose vanilla scent. 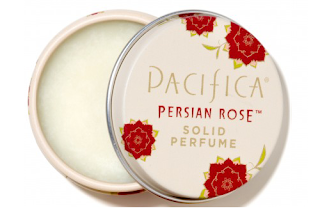 Persian Rose is very rosy, which means it has some of that contained fury, that thorniness, that roses proudly bear. The tin promises “notes of violet, myrrh, oakmoss and cardamom,” and there’s a spicy note so I’ll buy the cardamom, sure, but I don’t notice the other notes: this is all roses, all the time, and it works perfectly. I bought the tins expecting to be able to mix the scents, and sure enough, the three of these worn simultaneously are very, very attractive, the vanilla trimming the thorns off the rose and the coconut adding a splash of heat-wave sunshine. 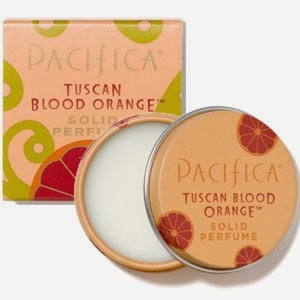 The fourth that I bought, Tuscan Blood Orange, is nothing like what you would expect, and the only explanation I have for having bought it is that my nose was completely fatigued at that point and I somehow didn’t notice that while it does have a cheery citrus top, it smells mostly of bright, synthetic raspberry, of the sort you encounter in candy aimed at the younger market. It’s actually rather horrible, to my nose, and I guess I’ll have to find someone to palm it off on. Pacifica solids are somewhat creamy and nowhere near as stiff as the Lush solids, especially if you swirl your fingertip around on the surface a little and let your body heat melt the wax a little: they’re solid, but they’ll take a fingerprint with no pressure at all. (Lush is largely Japan wax, which comes from sumac trees and is used as a substitute for beeswax, which it strongly resembles: Pacifica uses coconut oil and soy wax.) As you can see from the pictures, they come in tiny metal tins (a third of an ounce per) with rolled edges (the top of the Lush tin has a surprisingly sharp and potentially dangerous unrolled edge) packed in nice little cardboard boxes with slide-out drawers, probably great for storing little objects in (although I jettisoned mine). I paid $8 each and with the exception of the fake raspberry orange, I got my money’s worth. These go everywhere with me, and if I’m feeling a little underscented or under the weather, well, what did that advertising line say — “A little dab’ll do ya”?